You’ll see a growing number of floor mats and graphics being used by leading businesses today. Custom floor mats and graphics are an ideal way to project a positive corporate image while also taking advantage of unused interior surfaces for additional advertising. Floor Mats and Graphics incorporate the currently unused floor space of your business to welcome customers, reinforce your brand or to sell and promote featured products. Many of Signarama of Huntington’s customers have used our temporary floor graphics at special events. 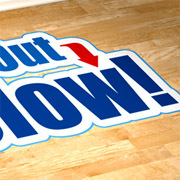 Some of the most memorable floor graphics entice the reader to “follow the clues” on a self guided trail of new products! A new range of specially formulated materials allows Signarama of Huntington to create floor graphics to get the message across while maintaining top durability in high traffic area. Our floor graphics resist tearing, scuffing and many abrasive forces. Signarama of Huntington’s floor graphics are removable and easy to care for. Many of our floor graphics are so high in durability that they can even be used outdoors on surfaces traditionally not used for signage like sidewalks and parking lot macadam. Signarama of Huntington’s floor mats are manufactured with a 100% rubber backing for slip and skid resistance. Fully launder-able and can be steam cleaned. Rubber backing is guaranteed to lay flat and will not crack or curl. Signarama of Huntington manufactures its floor mats and graphics on state-of-the-art digital printers with the ability to print photographic quality images, as well as sharp text and detail. Not only are our floor mats and graphics Designed for high traffic applications, but their bright colors and impactful design will get them noticed. We have the experience and creativity to put your message in front of many potential clients and customers! Imagine the possibilities with custom floor mats and graphics! For floor graphics in any size, color or shape, come to Signarama of Huntington and stay a step ahead of your competition!